FROM July 1 onwards, companies will be able to call a single number at the World Bank's (WB) Washington Dc headquarters to enquire about possible loans, political-risk insurances or credit guarantees for business projects in developing countries and the former Soviet bloc. These services for private companies are offered by the International Bank for Reconstruction and Development - the core institution in the WB group - and two affiliates, the International Finance Corporation (IFC) and the Multilateral Investment Guarantee Agency (MIGA). WB officials hail this streamlining of procedures as vital to "build up a thriving private sector" in the aforementioned countries., But critics are worried that it may result in lower environmental and social standards. 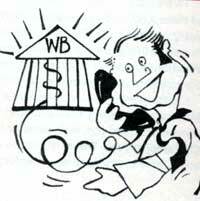 In 1994, the core W13 group lent approximately us $2 billion a year to several governments for private sector projects. The 1FC provided us $2.9 billion in loans and equity investments, while the MIGA issued us $1.6 billion in political-risk and related insurance for 155 projects. Until now, companies have found it very time consuming to apply for services at the W13 because eligibility criteria and compliance procedures vary from one affiliate to the other. Currently, there are about 20 private sector projects that receive aid from more than one WB affiliates. Most involve infrastructure and natural resource extraction, like road and pipeline construction and mining ventures. One recent example of such activity is the Maqui Maqui gold mine in northern Peru, which receives IFC financing and insurance from MIGA. The Hub thermal power project in Pakistan is seeking help from three WB affiliates. Reportedly, the WB is also reviewing a number of more complex projects involving two or more countries, like a natural gas pipeline from Bolivia to Brazil, an oil pipeline from Chad to Cameroon and a dam in Laos that will supply electricity to Thailand. Environmental and social NGOS, however, have expressed concern that the simplified procedures adopted by the WB may result in lower ecological standards. "The (WB) environmental guidelines and capacities regarding private sector lending are very modest. Yet, the private sector lendings of the WB have potential environmental impacts both in a positive and negative sense," says Peter Bosshard, an activist with the Switzerland-based Berne Declaration. '@iSome NGos believe that we should only work on matters that directly affect poor people, like nutrition and education, The thesis that we are defending is that these services cannot happen in a vacuum. We need to promote schemes that boost economic growth," said Bernard Pasquier, an 1FC staffer. Activists who attended the meeting pointed out that the WB needs to ensure that its review process is completely Itransparent' to communities affected by projects under consideration. "We emphasised that we appreciated the opportunity to talk with them, but that it would be important to broaden their interaction with other groups, particularly those outside of the us," says Andrea Durbin of Friends of the Earth. The Global Environment Facility (GEF) of the WB recently offered a grant to protect the forest cover of the Nakay plateau in Laos at a time when the 1FC and the International Development Association - which is an offshoot of the WB - were considering funding for the Nam Theun ii dam, which would flood the very same plateau. The issue was resolved to the utter dissatisfaction of environmental groups, as the GEF voluntarily withdrew the Nakay plateau project from its environmental protection plans. officials of the IFc and the WB are now attempting to avoid any kind of future conflicts by preparing joint country assistance plans. So far, eight countries have been selected for a pilot project, which is slated to begin in the autumn of the year 1997. This pilot project would include countries like the Cote d1voire and Mexico, followed by Brazil, Egypt, Indonesia, Kazakstan, and Poland. India also figures in the list of the selected countries.